I was going to post something today more volatile based on a conversation from last night, but I’ll save it. This really deserves its own post. Yep. I’ll be a CGMer sometime soon. Sadly, I won’t be able to get my Revel pump because I still have a functioning, CGM ready, pump under warranty. But I did call today and place my order. The insurance rep is supposed to call me next week. In theory, this should all be covered 100% by my insurance since I spent my deductible earlier this year. I check multiple times a day, so it’s not like I need to be conditioned to calibrate my sensor. Now I’ll prepare to join the ranks of Toaster-dom because I’ll be toting around, yet another, battery powered device that is worth more than my left leg. At least this one doesn’t have another wire to mess around with. Just another sensor to insert. Honestly though, if I’m kept alive by a series of electronics and machines, can I at least look like them? I did a trial for a bit with one of those, and was really impressed by how their reports pulled everything together. Can’t wait to hear how you like it! That’s good to hear. 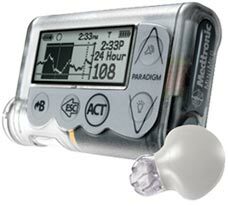 I follow a lot of Dexcom users, but not too many Minimed integrated users. So I haven’t heard a whole lot about it. More reading to do I guess.